The Samsung Galaxy Note 10.1 is a new flagship tablet from the Korean company that offers quad-core processing and an intuitive interface thanks to its S-Pen stylus. The Samsung Galaxy Note 10.1 is here: the latest high-profile tablet from the Korean tech giant, and one that sits across many intersections of what's fast becoming a complex Samsung family tree. While the Galaxy tag is a given for any Samsung mobile device nowadays, the Note range is also now seemingly becoming a separate line of its own. As with the original Samsung Galaxy Note - a smartphone that helped popularise the awful term 'phablet' because of its large display - the Samsung Galaxy Note 10.1 comes rocking an S-Pen: Samsung's stylish name for its stylus. So, in the confusing Galaxy of Samsung devices - where Y means Young, M means Magical, Pro means there's a physical keyboard and Plus means an upgrade - the Note moniker is pretty straightforward. It means you can, if you want, make use of a stylus. 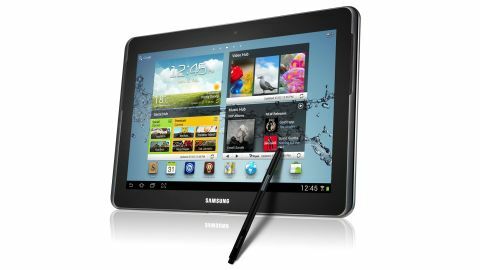 However, the term Note is not reserved for large-screened smartphones - the Samsung Galaxy Note 10.1 is a tablet, after all. But with Samsung already having just launched a 10.1-inch tablet into the market - the similarly named and similar-looking Samsung Galaxy Tab 2 10.1 - you'd be forgiven for scratching your head at this point (whether you use a stylus to do this is your choice). So the Note tag is now a label associated with premium mobile devices and Tab, despite its use on the original (and expensive) Samsung 7-inch and 10-inch tablets, now appears to indicate a more affordable entity. The Samsung Galaxy Note 10.1's spec sheet blows the Samsung Galaxy Tab 2 10.1's out of the water, you see, with a quad-core 1.4GHz processor (as opposed to a 1GHz dual-core one) and double the RAM. On the flip side, it will also do your bank balance more damage. The Samsung Galaxy Note 10.1 costs £399 in the UK or $499.99 in the US for the Wi-Fi only version, £500 (around $790 - cellular tablet price not announced in the US yet) if you want 3G coverage as well - both offering 16GB of storage. A 32GB version is available in the US for $549.99 (around £350). That's a price tag that, while cheaper than the Asus Transformer Pad Infinity, makes the new Note a bit more expensive than the quad-core duo that have come out of Taiwan recently - the Asus Transformer Pad 300 and the Acer Iconia Tab A510. And while we've resisted to use the 'i' word up until now, it's also impossible not to mention that this is a price point that puts the Galaxy Note 10.1 directly up against Apple's latest iPad (16GB version). The Android vs iOS argument is not one we're going to venture into here, but it's pretty difficult to ignore the fact that you can have the world's most popular tablet - complete with its incredible Retina display - for the same price as the Samsung Galaxy Note 10.1.